Three years ago I completed my first runDisney Half Marathon during Marathon weekend. This was my 3rd time running this specific race and 5th time running this course (since Princess has the same route). It will always hold a special place in my heart and I could probably run it blindfold and know where every mile marker is. 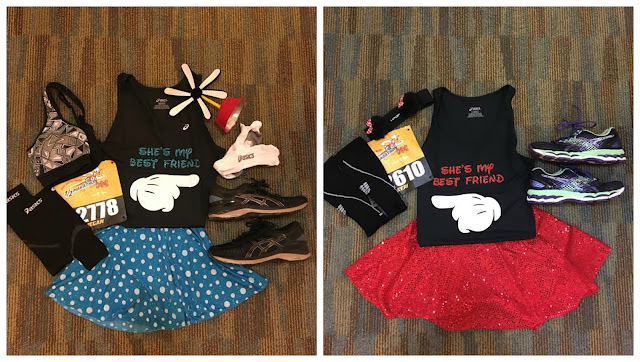 We made the decision to be Vintage Minnie and Modern Minnie Mouse Best Friends, with a twist on the popular "she's my Minnie, he's my Mickey" shirts you see all over Walt Disney World. My Mom made my Vintage Minnie flower which I put on the same hat used for last years Tweedle Dee and Tweedle Dum costume. Our alarm clocks were set for 3am and this is where the stress started. I have driven plenty of times to Epcot, leaving Bonnet Creek at 4:15 and never had an issue with getting to our corral on time. We packed our bags the night before since we had to leave directly from the race so we could get ready for our 7 night cruise on Carnival Valor. We both woke up very excited - we're running a half marathon and going on a cruise on the same day! There was way more traffic than normal getting into Epcot. Next time, I will leave at 4:00. However, traffic wasn't the problem. Once we parked our car, I saw a line that extended all the way to the middle median of Epcot (where you drive up and see the ball). There were thousands of people in line to go through security. 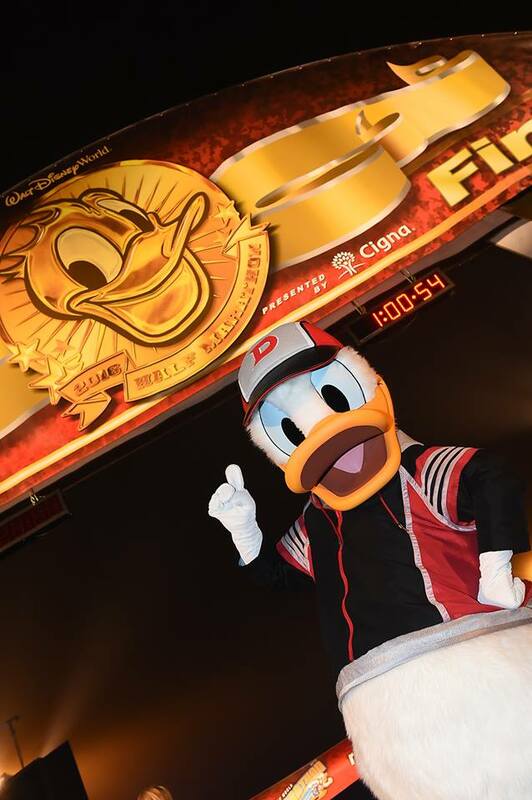 Disney heightened their security a month ago and this obviously went into effect for the race. I am all for the added security, this is for our protection - but they needed to have more people checking bags and scanning people. Once we went through that, we literally had to run the 20 minutes to get to our corral. I was in G, Keri was in F. By the time we got to the coral's, G was called. There was no downtime, we nearly missed our Corral. 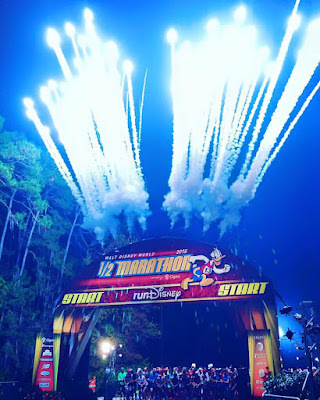 After the anxiety of almost missing our corral, my stomach was in shambles. Not to give TMI but I rarely have to use the restroom while running. Not the case in this race. It was making me angry actually because for every time we stopped, that was a photo opp we missed. Both Keri and I agreed not to stop for character photos in this race. We did take our obligatory Welcome into the Magic Kingdom sign. There were a ton of new characters on this course but with that said, I felt that there weren't as many photo stops as there were in the past. Maybe it's because we weren't stopping but I didn't see Mickey, Minnie or Donald on the course. I later found out that Donald and Goofy were switching off at the Golf Course photos. Christmas decorations were still up! This may sound silly - but my one goal was to get to the Magic Kingdom while it was still dark outside. Keri has never seen the Castle lit up and I really wanted her to see it. I was so happy when we entered Main St. USA in the dark. Once we went through the Castle, it became light outside. We made it by just a few minutes which made my day. Then things started hurting. Things as in my knee. My ankle was in perfect condition and I think that is 100% owe to the ASICS MetaRun. I regret not buying additional pairs and now they're back in the vault. The fog was awful - you couldn't see very far ahead of you. I couldn't see the med tents in the distance and all I wanted was bio freeze and a tylenol. Finally around mile 9, I found a tent and got fixed up. I stopped stressing about my knee and started talking about the cruise again. One new thing on the course was a giant hot air balloon. I really wanted to stop running and take a ride. This was the last photo we took on course because of the fog. It was so bad, you couldn't see the Epcot Ball once inside of Epcot. We finished the race, grabbed our snack boxes and a few bottles of water and headed to our cars. BOTH Keri and I almost fell asleep on the way home. Not good. We had less than 2 hours to get ready and head down to Port Canaveral to sail away for 7 nights on the Carnival Valor. Overall, we had a great time and didn't fight, which is a big plus for us (we've been best friends for 30 years, we are more like sisters).